Anyone who has ever taken a walk in the woods has seen them. Tires. They appear as circular black islands in shallow creeks and lurk beneath thorny undergrowth. Pyramids of vulcanized rubber can be found at trailheads like perverse monuments to illegal dumping. They’re everywhere. Not only are discarded tires unsightly, but they’re also a nuisance to public health. When water pools inside a tire’s hollow interior, it becomes the perfect breeding ground for pesky mosquitoes. Tires also don’t break down naturally. So unless someone hauls a tire away, it will become a permanent fixture in the forest. One place where tires can be found in abundance is at Elklick Woodlands Natural Area and Preserve, a 226-acre tract of land located in the heart of Sully Woodlands in western Fairfax County that is home to a globally rare oak-hickory forest. Tires are counted in the thousands there, but that’s changing thanks to an Eagle Scout’s project and the Fairfax County Park Authority’s Area 5 Management crew. During the past five months over 1,500 tires have been removed from the preserve as part of Bridgestone’s One Team, One Planet spent tire recycling program, a partnership with River Network, a nonprofit organization dedicated to protecting and restoring rivers and wetlands in the U.S. The program seeks to meet Bridgestone’s goal to reclaim one spent tire for every new tire the company sells in the U.S. each year. Since the partnership was forged in 2012, over 70,000 tires have been removed from public land and waterways (for free!) and sent away to be recycled into asphalt, mulch, playground surfaces, and other uses. Michael Torruella, a student at the New School of Northern Virginia, needed to complete a service project to earn his Eagle Scout award. After learning of the tire recycling program from his Boy Scout troop leader, Torruella contacted Kevin Williams, the Park Authority area manager in charge of maintenance at Elklick. Williams was more than happy for any help in getting the tires out of the park because state funds for refuse disposal had dried up in recent years. “We knew the tires were there but just never had a viable option to get rid of them without incurring substantial fees,” said Williams. He told Torruella where to find four large tire deposits on the property and provided guidance on how to access the undeveloped property. Torruella and 20 friends he recruited from his school, troop, and church spent seven hours gathering 500 tires at the preserve last fall, moving him within “one meeting and a letter away” from his Eagle Scout award. “I was able to pull off the whole project on donations of vehicles, a trailer, food, tools and labor. The only money I spent was five dollars on a roll of marking tape,” Torruella said. After seeing how many tires the group was able to remove, Area 5 Manager Williams decided to piggyback on the scout’s success. He knew his guys could get a lot more tires out of the preserve, but would Bridgestone pick them up? The recycling program had been created to help community groups remove tires from waterways, not for a county agency trying to clean up an inherited mess on the cheap. Bridgestone was sympathetic to the cause and made a one-time exception, arranging for Baltimore, Md.-based Emanuel Tire Company to haul away up to 1,000 tires. Williams placed Dolen Crawford in charge of retrieving the tires. Crawford, Ryan Herbert, Garry Murray, Sean Saunders, Rich Howes, Armando Crespin, and David Adams navigated a narrow dirt road through the park to one of the dump sites. The conditions were tight and the tires were knotted up in vegetation, but the hearty crew successfully extracted tire after tire and transported them back to the shop. “There are plenty more to remove. Hopefully, we can get a community group to join in on the next round,” said Williams. If you’ve seen tires in your local park or along trails, visit the One Team, One Planet website to organize a community cleanup. 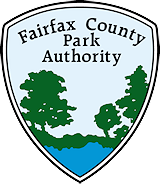 This entry was posted in Uncategorized and tagged Area 5, Eagle Scout, Elklick Woodlands, Natural Resource Management, Tires, Western Fairfax on March 19, 2014 by Fairfax County Park Authority.